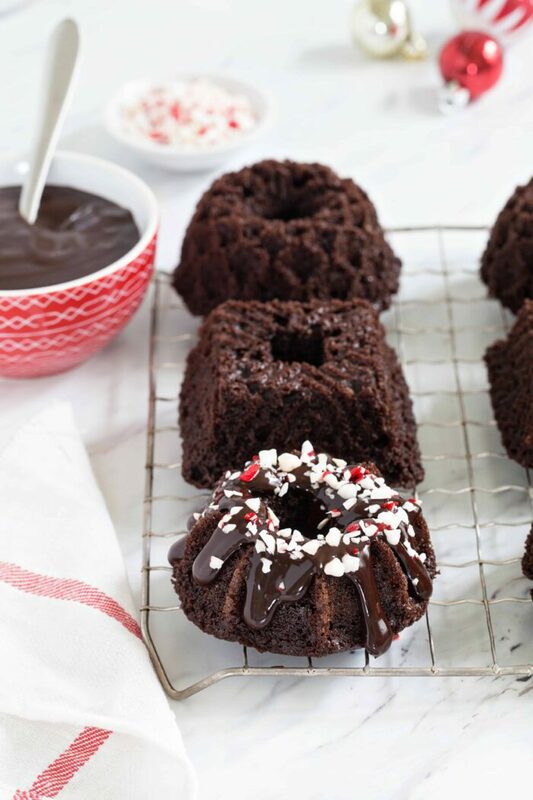 Chocolate Peppermint Mini Bundt Cakes are a fun and delicious dessert for any holiday party. A drizzle of peppermint ganache and sprinkling of crushed candy canes makes them super festive! This post is sponsored by The Hershey Company. All opinions are my own. Thank you for continuing to support the brands that make My Baking Addiction possible. If you’re at all like me, you might be feeling the pressure of the holiday season creeping in. As I’m staring at a closet full of unwrapped gifts and a to-do list no less than 1 mile long (okay, slight exaggeration there) the daily hustle and bustle has me feeling like I need to book an 8 hour massage. I am one of those people that tends to make the same recipes over and over again each holiday season. Because, A) I’m a creature of habit and B) I want my little babe to have sweet memories of food traditions that she can pass on for years to come. Baking, especially during the holiday season, is the ultimate expression of love, as far as I’m concerned. And that leads to true happiness. Tell me, how could anyone possibly be unhappy taking a bite of one of these decadent little cakes? They couldn’t. That’s what baking does. Happiness-bringers. It’s like when I tell Elle (at her grumpiest moments) that she better not smile. It becomes impossible not to smile. And in my mind, it’s the absolute same when you take a bite of chocolate-y, peppermint-y bliss. And I do mean bliss. It’s one of my favorites, so this lovely flavor combination graces our holiday dessert table year after year. 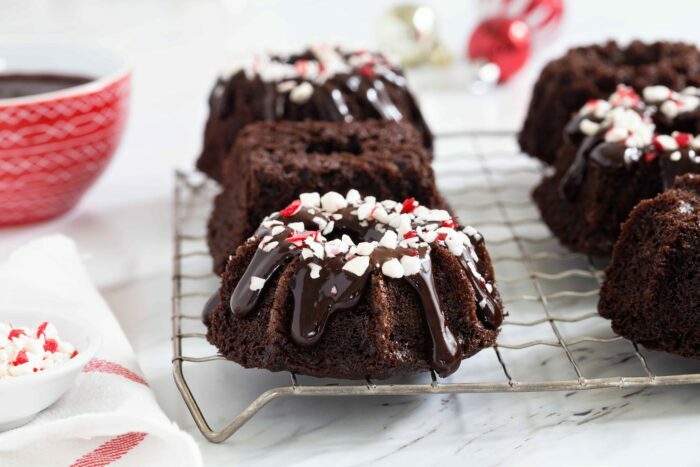 But instead of chocolate-peppermint brownies or cupcakes, this year I decided to kick my chocolate-peppermint game up a notch with these Chocolate Peppermint Mini Bundt Cakes. I think bundt cakes are a pretty underrated dessert. And while truthfully I can say they’ve never a holiday go-to for me, I think that’s about to change. I’m normally not a fan of specialty pans. Typically, that’s because they don’t get used often enough. But I make the exception for a beautiful mini bundt cake pan. I feel like they allow you to take a simple, unassuming cake recipe and turn it into something really special. And let’s be real here, I’ve always been a sucker for mini desserts – especially when there’s a rich, silky ganache involved. No fancy frosting here. Let the beauty of the cake shape shine, and enhance it with a glossy, gorgeous chocolate ganache. Making things look elegant with minimal effort – this is my jam! To make the ganache, I used HERSHEY’S SPECIAL DARK Baking Chips. They melt so easily and when combined with heavy cream and a little peppermint extract, they create the easiest “frosting” you could ever try. Bundt cakes, especially, mini bundt cakes, are perfect for just about any occasion. But especially for the holidays season. Who could possibly resist an adorable mini chocolate cake drenched with peppermint ganache and a sprinkling of crushed candy canes? Certainly not this girl, and I bet not any of your favorite party guests either. 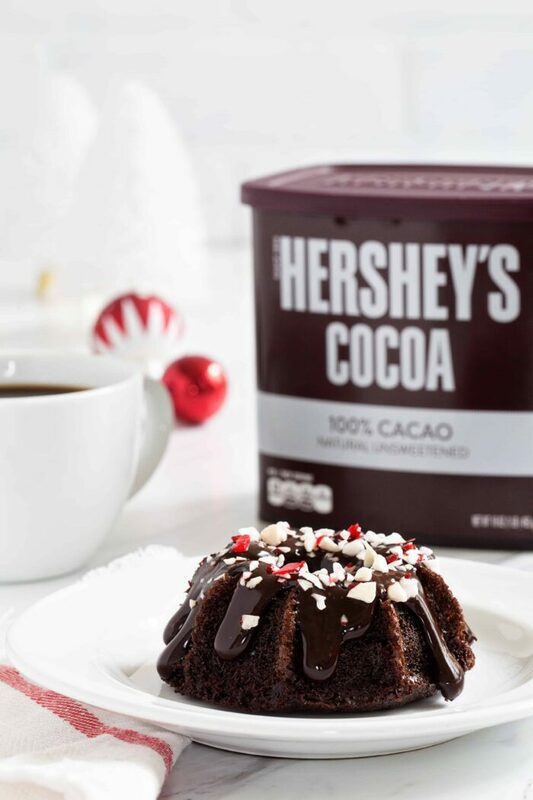 Taking that classic can of HERSHEY’S Natural Unsweetened Cocoa Powder, its flavor the pure definition of all baked chocolate things in my mind, and turning it into a beautiful dessert? That’s baking happy, my friends. Looking for a few extra tips to make your holiday baking a total success? I’ve got you covered! Check them out over on the HERSHEYS Kitchens Blog. 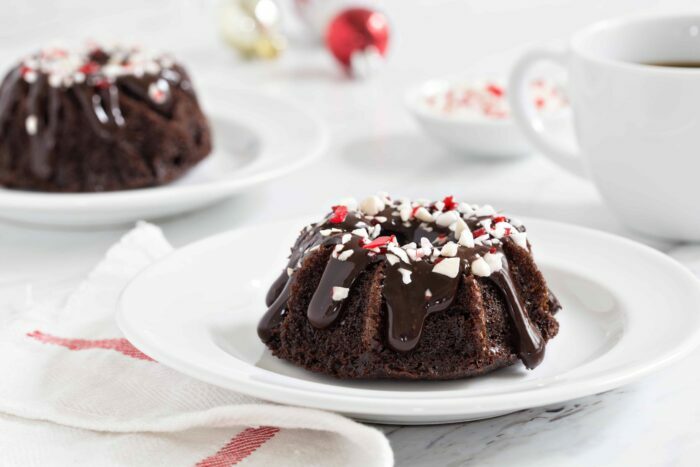 I hope you enjoy these Chocolate Peppermint Mini Bundt Cakes as much as we do! Happy Holidays to you and yours! Heat oven to 350°F. Spray the wells of a mini Bundt pan with nonstick cooking spray with flour. This type of baking spray will ensure that your mini Bundt cakes release from the pan with ease. In a large bowl, whisk together the sugar, flour, HERSHEY’S Natural Unsweetened Cocoa, baking soda, baking powder and salt. Add eggs, buttermilk, coffee, oil and peppermint extract. Beat with an electric mixer on medium speed for about two minutes; the batter will be thin. Pour batter evenly into prepared mini Bundt cake wells; filling each well about 3/4 of the way full. Bake in preheated oven for 16-20 minutes, or until wooden toothpick inserted in center comes out clean. 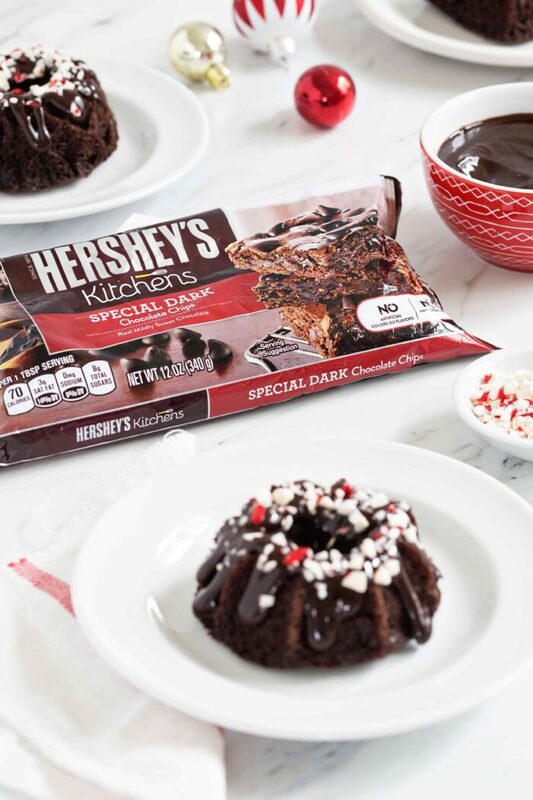 To Make the Ganache: Place HERSHEY’S SPECIAL DARK Baking Chips in a heatproof bowl. In a microwave-safe bowl, heat the heavy cream until it simmers. Do not allow the mixture to boil, or you could potentially have a mess on your hands. Pour the hot cream over the chocolate chips and allow it to sit for about 2 minutes. Whisk the cream and chocolate chips until a silky, smooth chocolate ganache comes together. Stir in the peppermint extract. 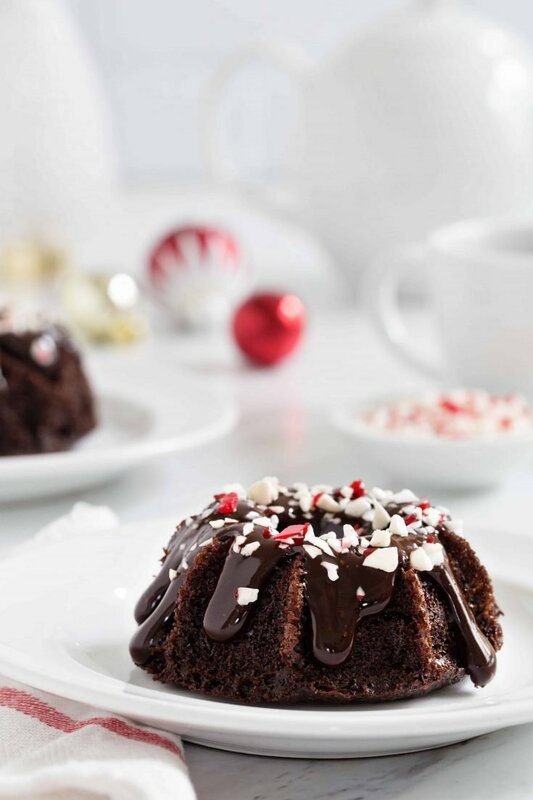 Drizzle ganache over the mini Bundt cakes and top with crushed candy canes. Mini Bundt pans have a lot of little nooks. I find the best way to clean them is to allow them to soak in hot, soapy water for about 20 minutes. Then use the sprayer on your faucet to help release any crumbs. Thanks so much, Natalie! Happy Holidays to you and yours! They’re the larger mini size, not bite-size. Hope this helps! Happy baking. These little goodies look absolutely decadent. I am looking to purchase the mini bundt pan. What one do you recommend? Hello! I have and love this one from King Arthur Flour. Happy Holidays to you and yours! How do I save one of your recipes to Pinterest?? It only goes back to your page when I click on it. If you hover your mouse over any of the photos, a little red SAVE button will appear in the upper left portion of the photo. Click the little red button and you can Pin right there. I hope this helps! I’m glad you discovered the joy of Bundt pans with these. This is one time you and I would have to agree to disagree. 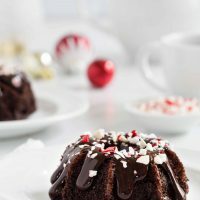 I love Bundt cakes and tube cakes and you can add coffee cakes in there too almost more than all the rest. Once you reach the quantity of baking layer cakes with frosting them on top of all that which I have (almost 60 years old as a hobby baker), it becomes a great joy NOT to have to think about torting a caking, dividing in layers, adding fillings, frosting and all the rest BEFORE it even comes to the decorating. Don’t get me wrong, I don’t DETEST doing layer cakes, if I’m not overwhelmed or overloaded and have the time to relax and enjoy it, I can definitely take great pleasure and pride in creating a beautiful layer cake. I still almost always do them for family and birthdays. Unless specifically requested, a Bundt cake just isn’t as much of a celebration cake as a layer cake. I recently did a Hummingbird cake for a family function and my mother thought it the best cake she ever ate. Considering I call my mother a “cakeaholic”, that was high praise indeed. But I look at Bundt cakes with sheer joy. I also ADORE the designs Nordic keeps creating although I can’t keep up with them as fast as they produce them. They can just make a cake. I do enough cakes that I use them all. However, like anything, I have my favorites and tend to go for those more often. I’m hoping Nordicware concentrate on their other lines for a while so I can catch up a bit. One cake I do in the Bavaria pan, which was used to create the Southern Living Christmas Cake on the cover of the magazine about 6 years ago, the Brown Sugar Bourbon, STILL to this day is one of the most requested and most popular cakes I do, AND one of the easiest. 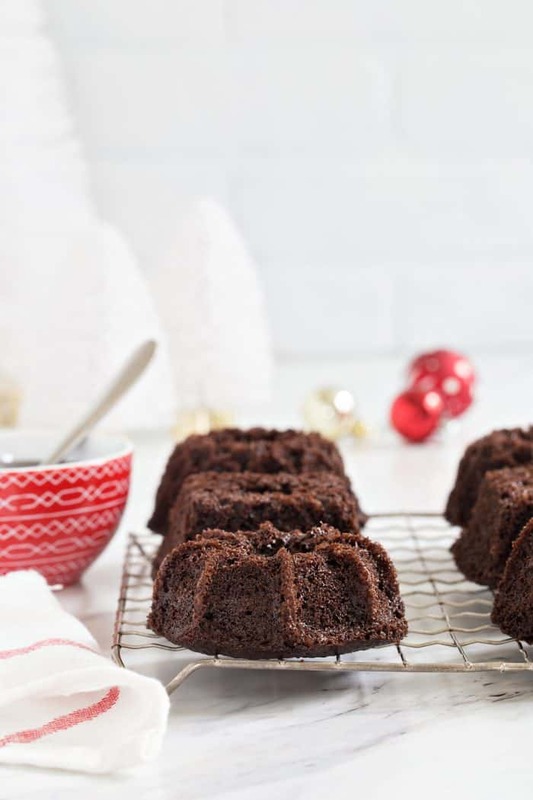 Bundt cakes only have two disadvantages (or maybe not, it depends) and one is the longer baking time and the pans cannot be placed in the dishwasher, as with most cake tins. I’ve discovered it is the detergent which causes the darkening of cake tins in the dishwasher. My life would improve 200% if I could only place them in the dishwasher. I would GLADLY pay a little higher for a special dishwasher detergent to avoid this problem. You can be sure the dishwasher would get the last of the crumbs from all those crevices if I could wash them in that machine, mine is pretty darn good. In fact, when considering a new one my appliance repair person said my machine, even with a few problems, does so much better than some other machines I should keep it as is until it completely goes kaput. (wish it could do the rest of the house then). Hopefully soon you’ll find another Bundt cake design you like AND a cake to go with it. Try the Chocolate Macaroon Bundt Cake that became extremely popular in the 70s after winning the Pillsbury bakeoff. It is still to this day one of my all time favorites and for many in America too, maybe THAT cake will convert you.